Margie’s work is rich in local folklore and tradition. She has written over a hundred original songs. She has performed many of these herself, but her works have also travelled with other artists across North America and the United Kingdom. Margie’s writing extends to poetry, plays, and short stories. Her book, And My Name Is . . . Stories Fromthe Quilt (Acorn, 2006), is a collection of short stories about ordinary women with extraordinary skills, gifts, and strengths. 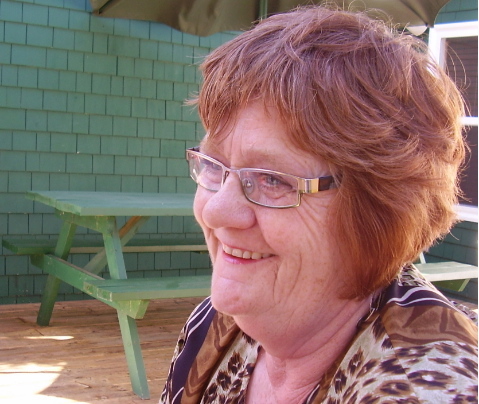 Margie Carmichael is true PEI red soil genius! I bought her book and enjoyed it thoroughly. She is one amazing wordsmith! I met her brother, Urban, the comedian, and her sister, Julie at a concert in the summer of 2007.That family is so talented and very steeped in their roots. A lady at Orwell Corner told me their Dad was a songwriter and wrote songs about the times and the people of the day. He also acted in live theatre plays. The apples definitely did not fall far from the tree in this talented bunch.